The Synergy 380 is a feature-rich garage door operator system, built to last and guaranteed to provide years of smooth, trouble-free performance. 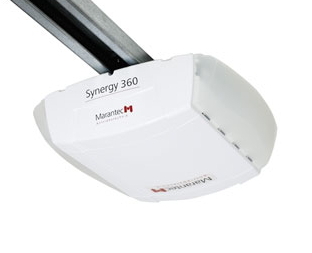 LED lighting and reduced stand-by consumption make the Synergy 380 the most efficient residential garage door opener available, while the direct current (DC) Smart Motor , coupled with a chain or belt drive system, ensures an amazingly quiet operation. Optimizes operator service life and trouble-free performance. Adjustable light timer from 30 seconds to a maximum of 4 minutes 30 seconds. Electronically Controlled - Prevents premature door and operator wear and provides quieter operation. 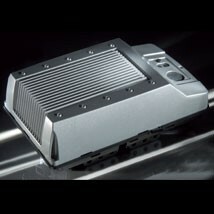 Limited Lifetime Warranty on Motor, Gear Assembly and Rail System. 8 - year Limited Parts Warranty. Provides security and convenience by allowing the usage of the garage door operator in case of a power outage. The opener will continue to function normally, including the lighting system. The Synergy 370 is a feature-rich garage door operator system, built to last and guaranteed to provide years of smooth, trouble-free performance. LED lighting and reduced stand-by consumption make the Synergy 370 the most efficient residential garage door opener available, while the direct current (DC) Smart Motor , coupled with a chain or belt drive system, ensures an amazingly quiet operation. 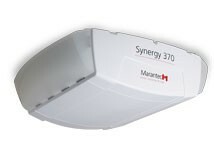 Ideal for basic residential garage doors up to 8’ high, Synergy 360 offers high end features you would expect from a Marantec garage door operator. The DC motor provides for very smooth and quiet operation and integrated LEDs offer 500 Lumens of energy efficient lighting and the optional battery back-up system will provide you with access to your garage during a power outage. Synergy 360 can also be upgraded with a timer-to-close module that automatically closes your garage door for you. Safety and convenience for you and your entire family. Designed and built in Germany with highest standards for safety and quality, Synergy 360 is the first residential garage door operator system that offers integrated LED lighting. Not only is LED lighting very energy efficient but with a life expectancy of over 30.000 hours you will never have to replace a burnt-out light bulb in your garage door operator again. LED extension kits are available to double the lighting capacity from 500 Lumens to 1100 Lumens. An optional battery back-up system ensures that you can open and close your garage door in case of a power outage. As an additional benefit, the LED lights of the Synergy 360 will continue to work when the opener is running off of battery power! A pre-tensioned, 3-piece belt rail system allows for an extremely easy assembly, while a 1/2 HPcs* motor provides for an amazingly quiet and powerful operation for heavy carriage house or wind loaded garage doors. Synergy 360 offers programmable door travel speeds up to 7.0 inches per second and can be set separately for the up and down travel cycles. An integrated LCD display guides you through the simple 3-step programming sequence while the Synergy 360 automatically calculates and maintains the force and sensitivity levels required to open and close your garage door. Considered the safest and most reliable garage door operator system available, Synergy 360 will provide you with many years of reliable and maintenance free performance. The Synergy 270 is a feature-rich garage door operator system, built to last and guaranteed to provide years of smooth, trouble-free performance. LED lighting and reduced stand-by consumption make the Synergy 270 the most efficient residential garage door opener available, while the direct current (DC) Smart Motor , coupled with a chain or belt drive system, ensures an amazingly quiet operation. that is designed for a smooth operation of doors up to 14ft high with a faster open and close cycle, built to last and guaranteed to provide years of smooth, trouble-free operation. It features a maximum run timer, a programmable mid-stop, a timer-to-close, a safety reversal system and an advanced drive system. Its advanced digital Easy Operating System (EOS™) provides a user-friendly set up which makes for a more efficient and faster installation. The direct current (DC) Smart Motor, coupled with a belt or chain drive system, ensures an amazingly quiet operation. Maximum Run Timer – Protects against damage to door and operator, door stops and reverses Electronically Controlled - Prevents premature door and operator wear and provides quieter operation Advanced plug-in design compact fluorescent light (CFL) system. One (1) bulb, 14W Max – not provided (equivalent to a 60W incandescent). 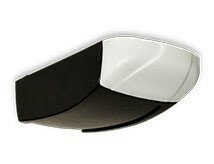 The light fixture has an integral high impact, heat resistant, UL recognized plastic, lens cover. The best in advanced engineering and materials. One semi closed fully assembled drive system with a 14 Ga. (2 mm) heavy duty, high strength galvanized steel finished C-rail, available with a steel-reinforced belt or a full steel chain. Door Heights Supported: 7ft, 8ft , 10ft, 12ft and 14ft. Momentary contact to open and stop with constant contact to close. Open/close/stop functionality with lock capability.